Products with shapes or designs of birds of all kinds: seagulls, owls, pelicans, roosters and more. You will find birds by units or in assorted packs. 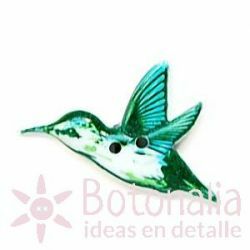 Product Description: Button with the shape of a hummingbird in yellow flying.Length: 28 mm.Content: Price is per unit.Material: Plastic. Decorative button with the shape of a flying duck in beige color. Perfect for needlework projects or patchwork, as well as scrapbooking, card making and other crafts.Content: Price is per unitDiameter: 28 mm approx.Material: Plastic. Decorative button with the shape of a pair of white doves in a hug. Perfect for needlework projects or patchwork, as well as scrapbooking, card making and other crafts.Content: Price is per unit.Diameter: approx. 24 mm.Material: Plastic. Decorative button with the shape of a bird (swallow) in grey. Perfect for needlework projects or patchwork, as well as scrapbooking, card making and other crafts. Content: Price is per unit. Diameter: approx. 27 mm. Material: Plastic. Product description: Button with the shape of a little blue bird. Perfect for crafts and needlework, scrapbooking and card making, patchwork, etc. Content: The price is per unit. Diameter: 24 mm. Material: Plastic. Decorative button with the shape of a peacock in blue with golden feathers at the tail. Perfect for needlework projects or patchwork, as well as scrapbooking, card making and other crafts. Content: Price is per unit. Diameter: approx. 49 mm. Material: Plastic. 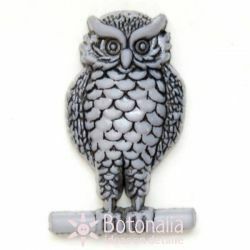 Product Description: Decorative button with the shape of a grey owl. To be used in craft, sewing, card making, patchwork and scrapbooking projects.Content: price is per unit.Diameter: 28 mm approx.Material: Plastic. Product Description: Button with the shape of a black bird (swallow). Perfect for patchwork and scrapbooking projects, as well as any other sewing or craft projects.Content: Price is per unit.Diameter: 18 mm.Material: Plastic. 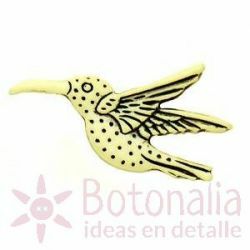 Product Description: Decorative button with the shape of a pelican.Content: The price shown is per unit.Dimensions: 28 x 16 mm.Material: Plastic.